Basically, erosion from the (last remaining, I think) liner in the rear tire of Mary’s bike caused the first flat; I patched the tube and didn’t notice the gash. After the blowout, I patched the tube again, booted the gash (with a snippet from a roll of PET bottle plastic I carry around for exactly that purpose), stuck an ordinary patch atop the boot to cover its edges, and the whole mess has held air just fine for the last week. I’m reluctant to mess with success. Not having a tire liner caused the third flat, this time on my bike. The wound looked like a nail or glass shard punched directly through the Kevlar armor behind the tread. Fortunately, it happened (or, more exactly, I realized I had a flat) half a mile from home, so I fired a CO2 cartridge into the tube and pedaled like crazy, which got me halfway to the goal and I rolled the rest of the way on a dead-flat tire. The rubber forming the protrusions has the same thickness as the rest of the tube, so you’re looking at soft, flexible shapes, rather than thick bumps. The “liquid” inside must be a thin film over the inner surface. I’ve never been a big fan of tire sealants, mostly because they’re reputed to ooze to the bottom of the tire into off-balance puddles. This entry was posted on 2016-08-14, 07:10 and is filed under Machine Shop, Recumbent Bicycling. You can follow any responses to this entry through RSS 2.0. Both comments and pings are currently closed. Well, tire liners are how I got into this mess: they abrade the tubes enough to cause slow leaks. So I’m done with liners! When I can see the boot through the gash, I’m certain Tyvek (or a greenback) would erode in short order. Of course, that means I should replace the tire, but the tread hasn’t worn down to a slick and I’m a cheapskate (*). I’m not sure how a thicker boot will work in the long term, which is why I’m letting it sit in there until something (else, I hope) fails. (*) And the guy fixing the flat, whenever it occurs, so the authority and the responsibility match up quite nicely. I used to carry 1.5″ x 3″ ovals cut from a dead 26″ road tire in my flat kit. 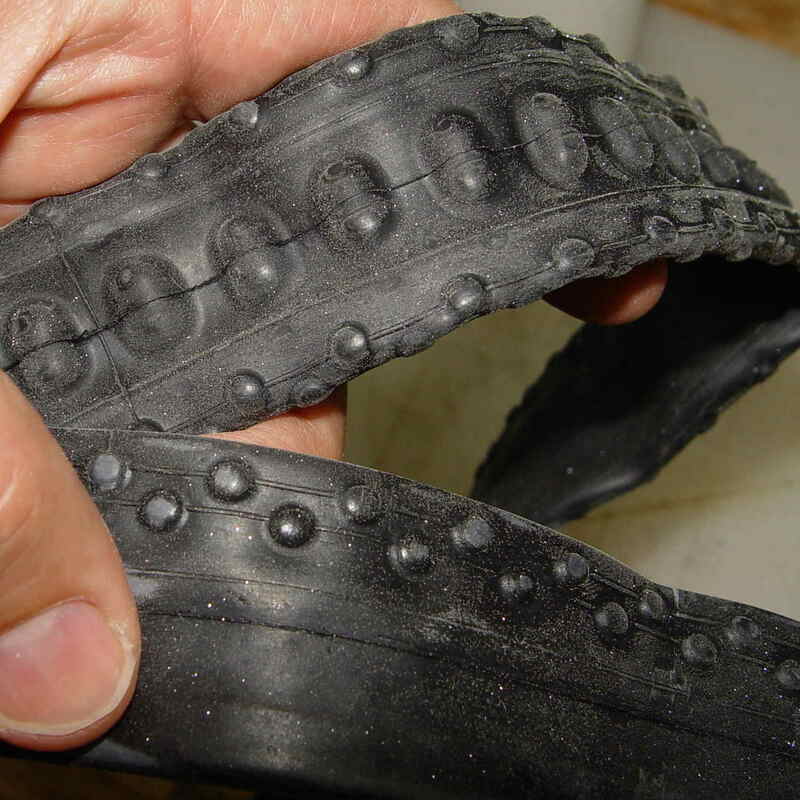 If I got a bad tire cut, the patch would serve to protect the tube; it’d get me home if I had trouble on a long ride. IIRC, you were in goat head thorn territory, where even steel plate might not have helped! 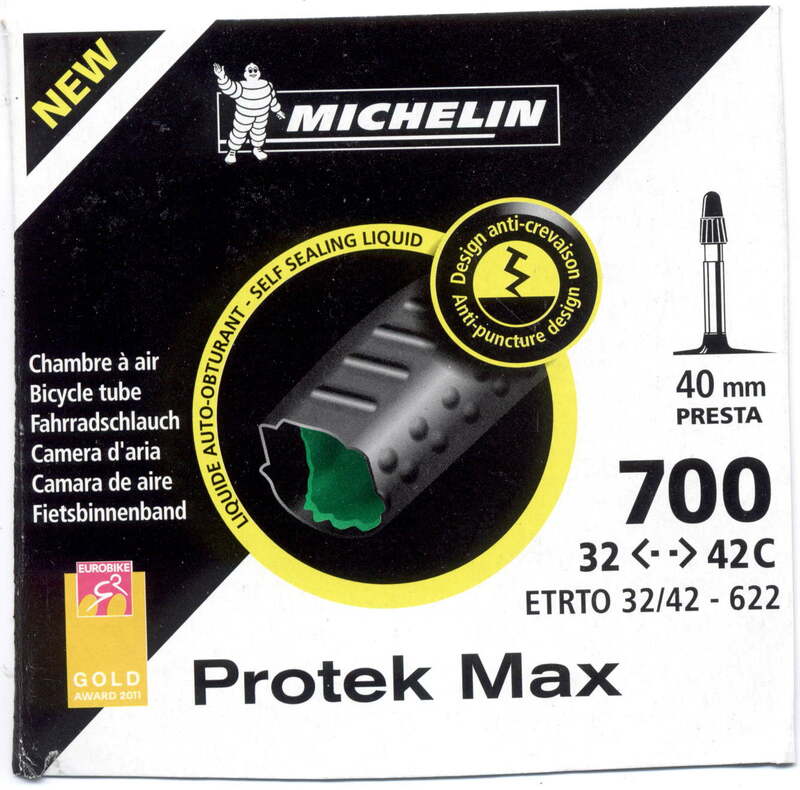 So, the new tubes appear to sell for 2x what regular Michelin tubes do. Do you figure they are twice as good? Absolutely beats me: regular tubes don’t survive, so trying something else seems worthwhile. Even though any flats seem like too many, I’m not ready for solid foam tires.